“So, basically, we’re looking for someone who won’t intimidate them. An adult presence in the classroom that eight-year-olds will view as a peer, someone that they can consider one of their own?" Being the man-child that he is, it was only a matter of time before Castle went undercover in a school. I didn’t expect it to be second grade, however. The case of the week was convoluted, involving far too many people and a villain that we didn’t see until the very end. It might have worked if the rest of the story had had a bit more gravitas. Instead, the case felt a tad shoehorned and rushed. I would like to have gotten to know Anton, Jaffe and Natalie a bit more. Having said that, the scenes with Castle in the classroom were adorable and fun. 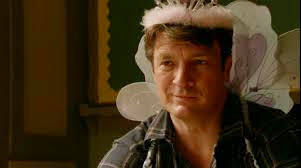 While watching Castle crawl around on the wet grass and play soldier made me smile, watching him in wings and a tiara play princess with Emily made everything all right in my world. I’ll bet he was a fabulous dad when Alexis was younger. In fact, he still is a great dad. Alexis being freaked out about her father disappearing for two months is perfectly natural. The fussing was sweet, but putting the app on her father’s phone was a step too far. I loved the way Castle handled it. He acknowledged Alexis’s feelings, acknowledged that she has always been the adult, but gave her some really good advice. Before insisting that they ride off on their brand new scooters. Again, adorable. So far this season, the writers are doing a good job of reminding us that Castle has just been through a lot. They are not dwelling on it week after week, but every episode reminds us of what happened. When Castle says to Mrs. Ruiz, “an experience that powerful is going to find a way to express itself and end up on the page,” I flashed to an eleven-year-old boy in the woods experiencing something so strong, he has spent his life writing about it. Subtle, but effective. I liked this episode, not for the story but for the scenes with Castle/Fillion and the kids. Two and a half out four teas sweetened with low calorie fairy dust. — Potato chip fudge ice cream? I’d rather do the dishes as well. — The second time through the episode, the information that Natalie chooses to share with Esposito and Ryan the first time they interview her is odd. For someone who was so closely connected to what had happened, she chose to share a lot more information than I would guess she should have. — Mrs. Ruiz is played by Michael Hyatt who was also Brianna Barksdale. The sign of a good actor, I couldn’t place her and had to resort to IMDb. Mrs. Ruiz: “I didn’t do much to deserve [a medal]. I would watch a spin-off of Nathan Fillion interacting with second graders. That was priceless! Loved every moment of Castle with those kids. Always nice to see Michael Hyatt again. She deserves a lot more work. She also showed up on Veronica Mars. She was a fellow juror when Veronica had jury duty, and in that ep., she was an administrator at Hearst College who encouraged V. to apply there.